It is important to us at Blue Iris Landscaping LLC that we design your patios, paths and driveways to be beautiful, functionally comfortable, and structurally sound. 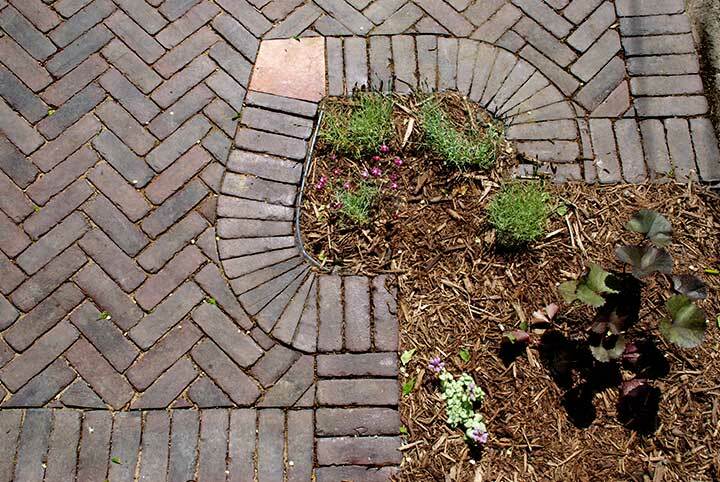 At Blue Iris Landscaping LLC we have been trained, tested and certified by the national brick paving institute (Interlocking Concrete Paving Institute), so you can be confident that your hardscapes will last for years. We are confident enough in our workmanship to give an extended five year guarantee on our brickwork. We start by determining what type of soil you have which dictates how deep your gravel base needs to be. On average the gravel base is six to ten inches thick for patios and twelve to eighteen inches thick for driveways. After the excavation we compact the subsoil and begin laying gravel in four inch layers compacting after each layer. Once we have reached the desired height and pitch for proper drainage we lay down a one inch layer of sand and begin to lay the main body of the brick work. When the interior of the brick work is laid, we create a soldier's row of bricks around the outer perimeter. This acts visually to frame the patio and stabilizes the edges, keeping the inner bricks tight. We cut the soldier's row brick to fit tightly so you have a firmer edge, and tight fitting bricks discourage weed growth. As a final stabilizer we add brick edging to keep the soldier's row in place. If the patio is raised up or will have excessive pressures (i.e. a driveway) we embed a layer(s) of geo grid into the gravel base of the patio/driveway to stabilize the gravel base. We are confident enough in our brickwork that we give a five year guarantee against uneven settling.